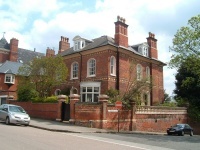 Arnold was born on 23 May 1807 in the family home of Lambley Lodge near Belton in the County of Rutland. 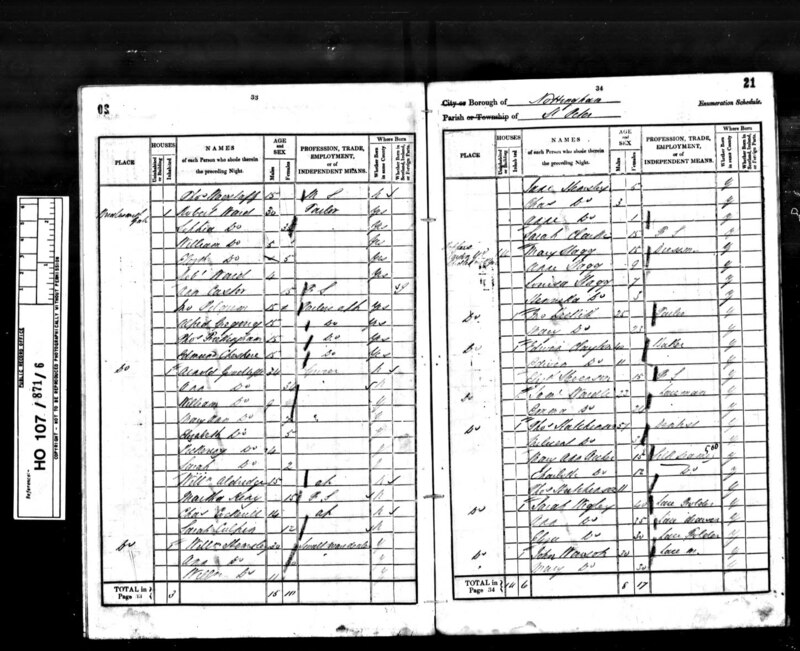 We know a lot about Arnold's life as his son Thomas convinced Arnold to write down his recollections of family, business and other information. 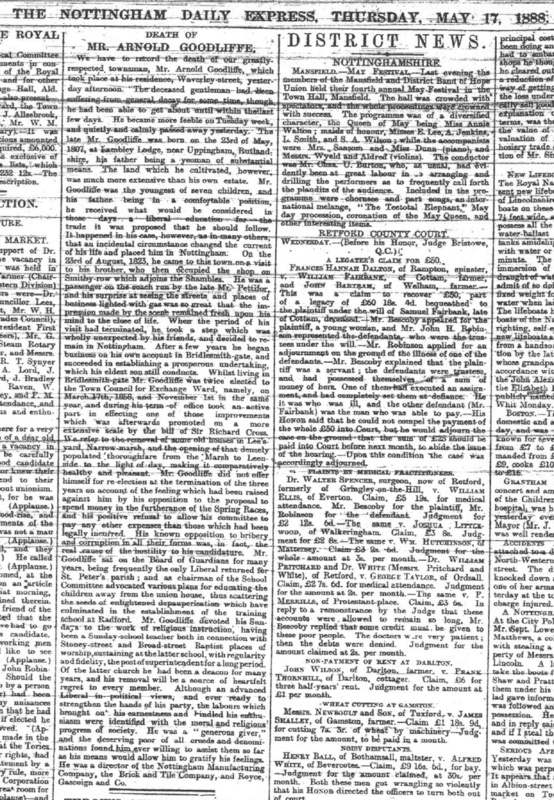 By some chance, this story has been preserved and a typescript copy was given to Elizabeth Higgins (daughter of another Arnold Goodliffe) who has preserved the story. 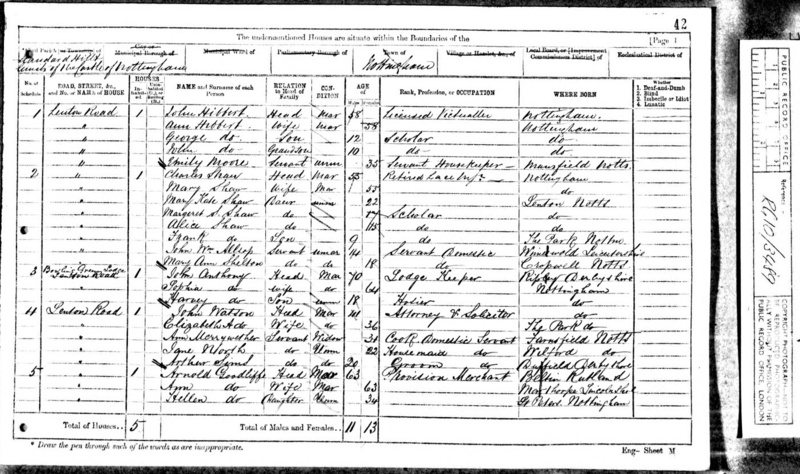 A copy of Arnold's history, entitled "The Story of My Life" is provided here. Daniel and I went to Leicester, took some sheep to sell, after we had sold them I went to the Stag & Pheasant Hotel, mounted old Thomas Pettifore's old coach for Nottingham, and soon felt interested, it being the first time I had ridden behind a four-in-hand. We rattled away, changing at Loughboro' and Bunney, The lights of Nottingham, its Castle and fine old Church came in view as we descended old Ruddington Hill. The old Trent spanning the broadest river I had seen was interesting to me. The Steep Stone Hill, old narrow Bridlesmith Gate lit up with gas and still narrower High St with a strong beam across on which swung an immense painted Blackmore's head, underneath which our old coachman drove to the White Lion, Clumber St, where we arrived about 8.30. To me the memorable Saturday August 23rd 1823. 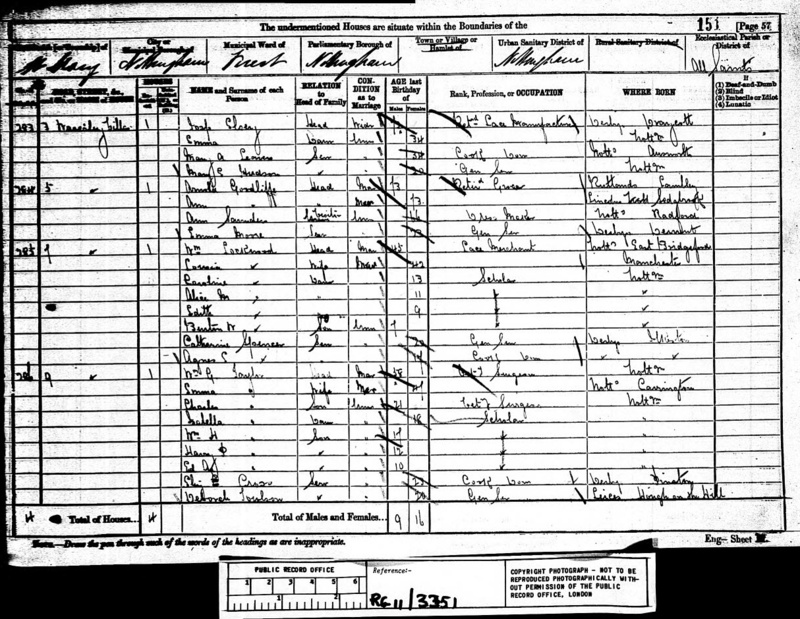 Arnold worked in his brother's provision shop as general errand boy, liked Nottingham and decided to stay. 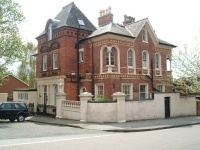 About 1825 William took a shut-up shop in Bridlesmith Gate and began business as a Provision Merchant. 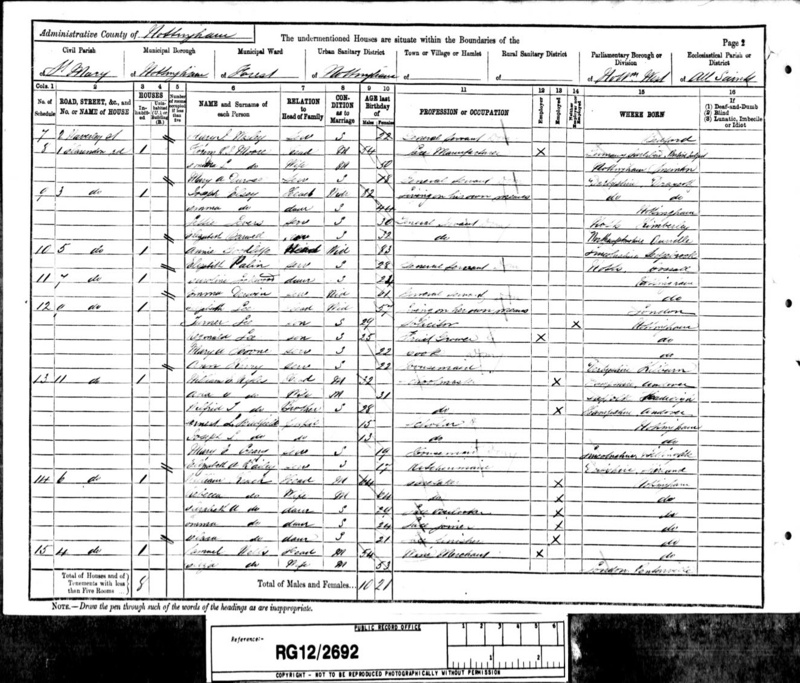 Mary Culpin Goodliffe niece 20 shopwoman Northhampt. 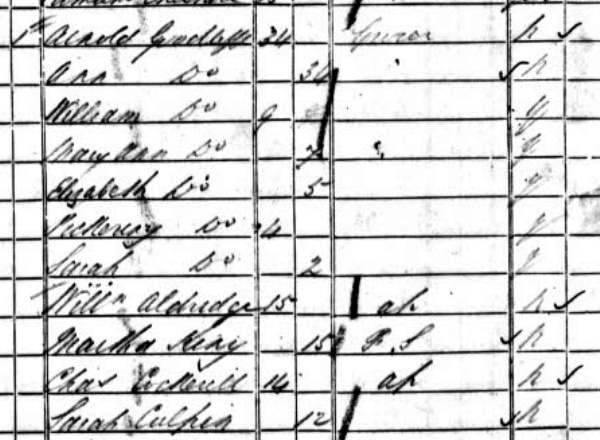 It is interesting to note that on the 1871 census, the next door neighbour was John Manning, Mayor of Nottingham. 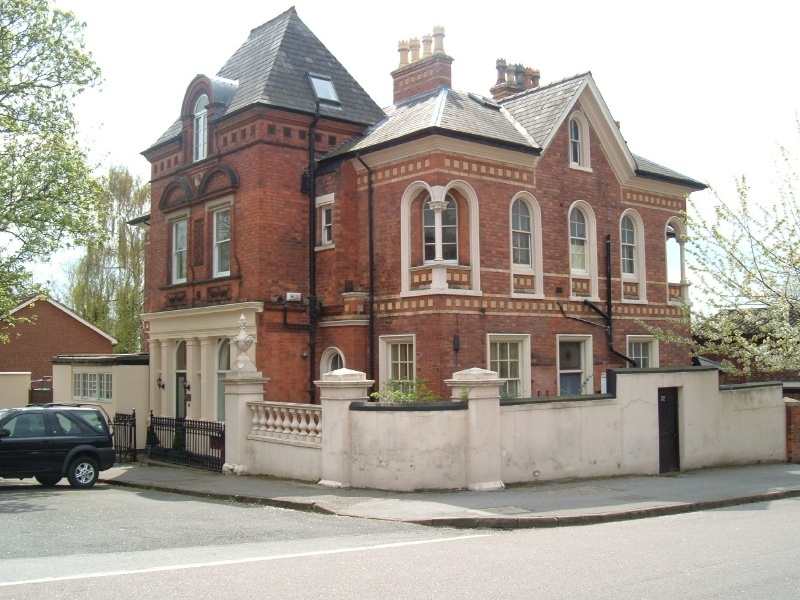 >No 31 Lenton Rd. 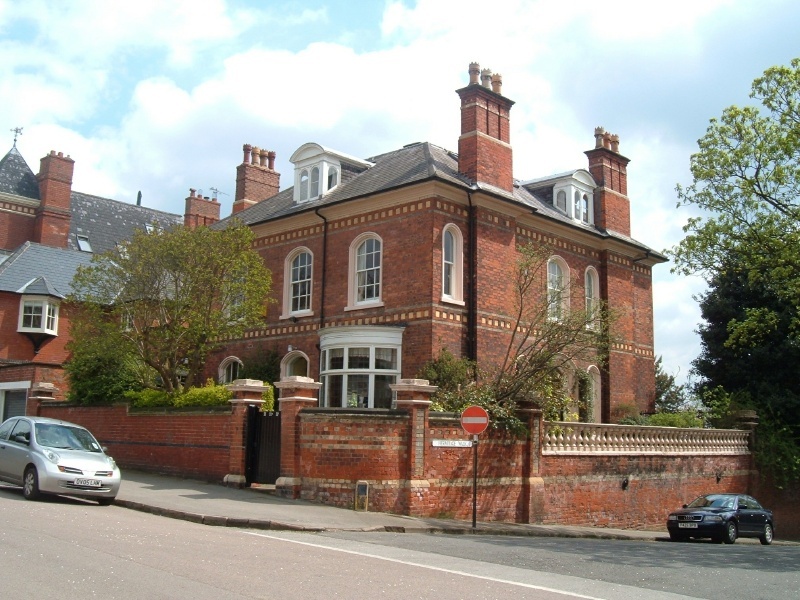 This might have been Arnold's house, but is more likely to have been built for John Manning, Mayor of Nottingham. 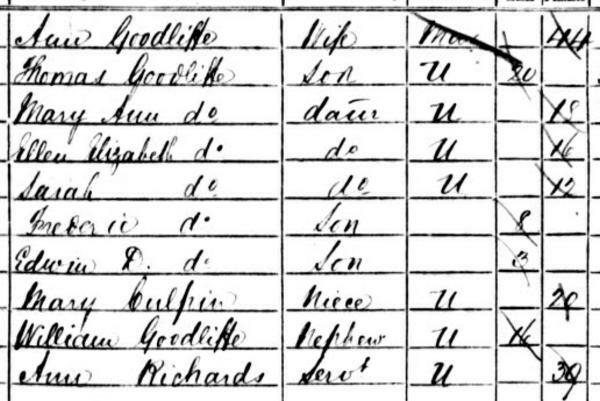 Helen Elizabeth Goodliffe died in 1872. 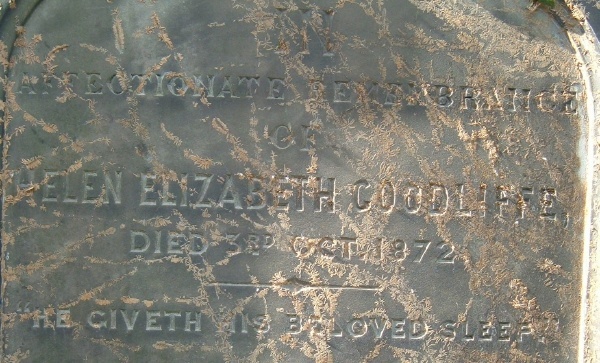 She is buried in Nottingham General Cemetery. 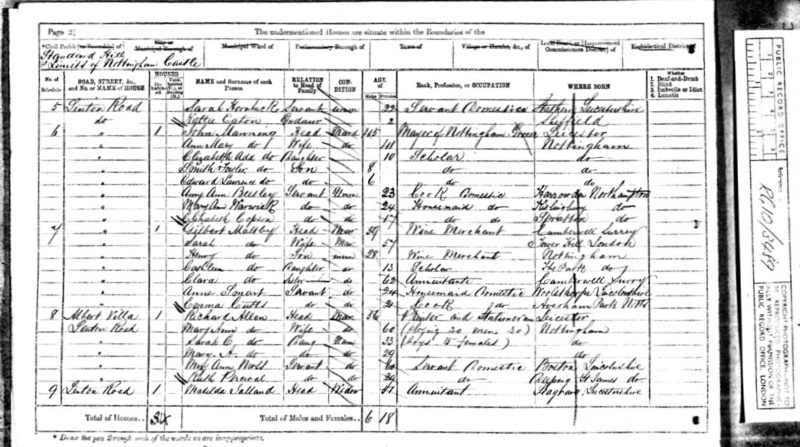 In the 1881 census Arnold and Anna were at 5 Waverley Villas. 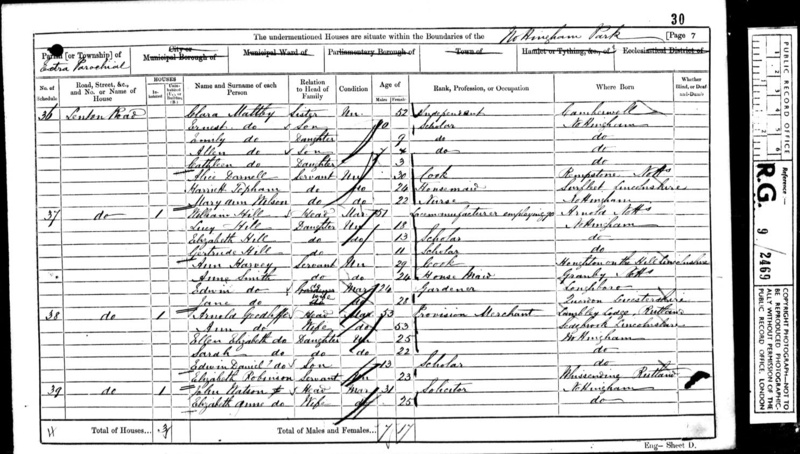 Arnold died there (5 Clarendon Rd on the death certificate) on May 16th 1888 aged 81 and is buried with daughter Helen. His cause of death is Chronic Gastritis, exhaustion, senile debility. 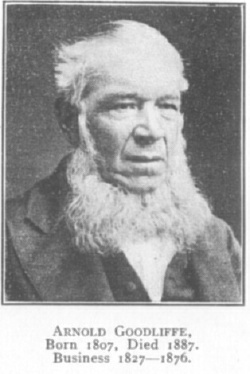 His Obituary was published in the Nottingham Daily Express, Thursday May 17, 1888. 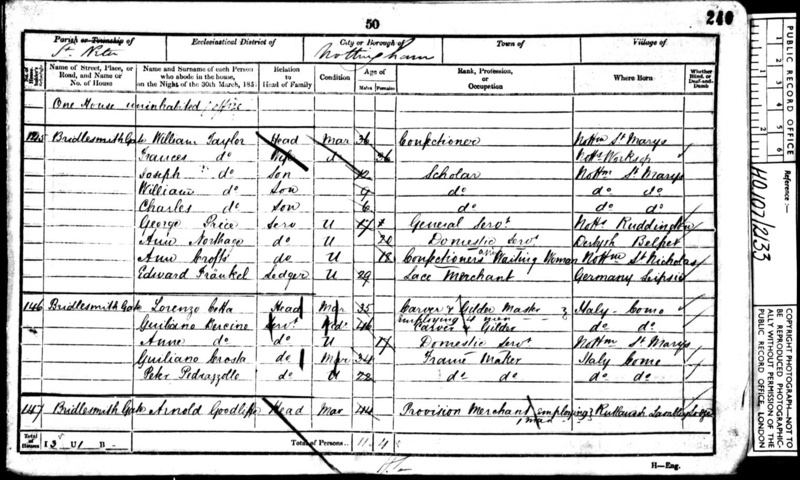 In the 1891 census, Annie was living at 5 Clarendon Rd with a servant (Elizabeth Palin (28)), although Whites 1894 Directory of Nottingham lists Anna at Waverley Villas, 5 Waverley Mount. 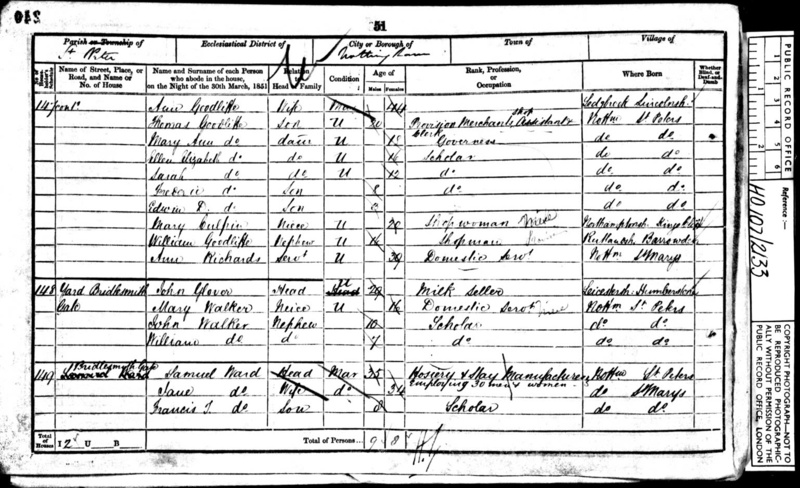 Annie died on December 25th 1895 aged 88 and is buried with daughter Helen and husband Arnold at Nottingham General Cemetery. 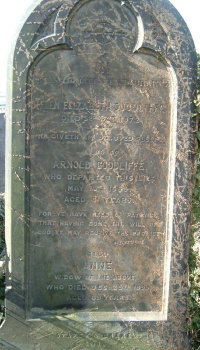 Close-up of Arnold Goodliffe's headstone. 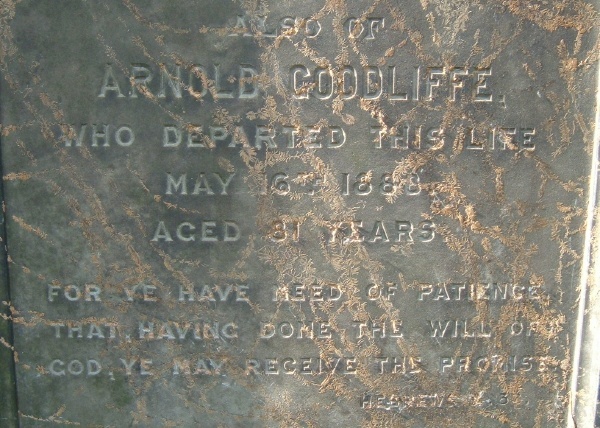 The inscription reads: "Also of ARNOLD GOODLIFFE who departed this life May 16th 1888 aged 81 years. 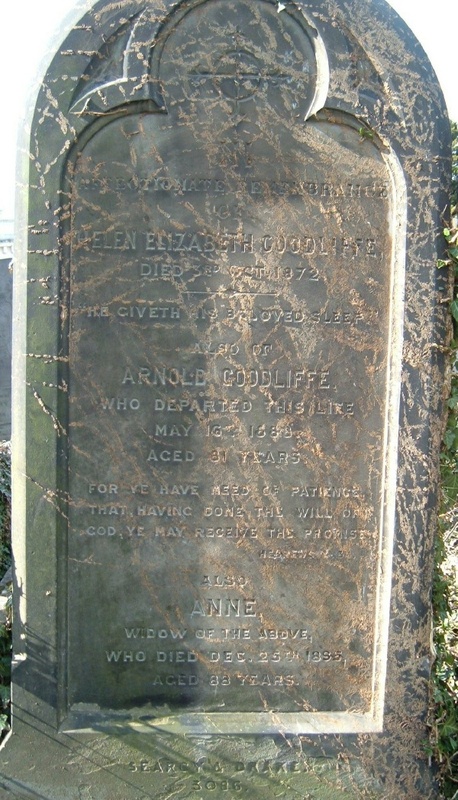 For ye have need of patience that having done the will of God, ye may receive the promise"
Close-up of Anne Goodliffe's inscription, which reads "Also Anne, widow of the above who died Dec 25th 1895 aged 88 years"
Close-up of Helen Elizabeth's inscription, which reads "In affectionate remembrance of Helen Elizabeth Goodliffe Died 3rd Oct, 1872 "He Giveth His Beloved Sleep"